Success is a gift. When we find that sweet spot of passion and gifting, it’s exhilarating. But success can be toxic, too. It can lead us down paths we never meant to take. Ones that lead far away from the One who calls us His. The one who calls us chosen and worthy. Today I am thrilled to bring you a first, not only to #ChosenandWorthy, but to Searching for Moments! That first is a post written by a man for whom I have much respect. Horace Williams Jr. is a man of strength, of courage, and of prayer. His story gives us hope and reminds us how important it is to remember our identity comes in knowing Whose we are rather than in what we’ve accomplished. We so often dismiss identity issues as something with which only women struggle. But, friends, that’s not the truth. A man’s struggle with identity may look a little different, but at the core of the issue, we are the same. In order to live fully free with victory and purpose, we need to see ourselves as more than simply a sum of our experiences and accomplishments. Do you remember what it felt like to be chosen for something? Or even worse to not be chosen? When I think back to my childhood, it is where I started my journey on the road to Damascus. Although, I did not know it at the time this road would transform my life forever. I was a pretty good athlete as a youngster, running faster and jumping higher than most of my friends. I remember a burning desire to play football, so my parents enrolled me in pee-wee. The overwhelming excitement every Saturday morning as I jumped into my uniform was exhilarating, as were the kudos from coaches and teammates. The congratulations of proud parents on the way home after a game was the cherry on top. It was my first taste of success, and being a “star,” and it was intoxicating! In junior high, I remember we would pick teams to play touch football or kickball each morning before the school bell rang. I was usually a captain. I still remember the hopeful faces of classmates and friends. There was a sadness in their eyes as they hoped to not be the last one standing. Being chosen makes you feel wanted or needed, however you must listen when your name is called. Now back to what I shared earlier and how intoxicated I became with success at a young age. I was ecstatic when my father attached a basketball goal over our garage. I would practice for hours on end until it became too dark to see. My mother would look out and turn on the porch light while giving me 10 more minutes. All those solo practices paid off. In the 8th grade, I was chosen for the varsity basketball team. When you travel along on any road, there are warning signs. The signs are there to help, give you direction, and provide safety. Yield. One way. Detour. Stop. They are all signs we see on the road. In life, you may encounter signs that affect you without even realizing it. There is a warning sign I received from my mother at a young age that I carried in my mind for most of my adult life. I had begun to enjoy my success in athletics, and it started to go to my head. The popularity and the adulation had my head up in the clouds. Then it happened…I brought home a below average report card from school. Even at a young age that shook me to my core. It was no longer about getting ice cream on the way home after a good game. This was about my life. I did not want to “struggle” as my parents did. I had to be better. Although I wish I could tell you it was at this point I hunkered down and began seeking Christ with my whole heart, it was not the case. I gave up playing the piano when forced to choose between playing sports and my part-time job. Practicing basketball harder and longer allowed me the enjoyment of the rewards of my success. I won several trophies and MVP awards, and I was dating the head cheerleader in school. Two knee injuries brought about the painful realization that I would never play sports in college or professionally. The sad part at the time is I was ignoring Jesus Christ in my life. I was raised by Christian parents, attended church every Sunday, we prayed as a family every night, and yet I still was not comprehending the reality of why God had chosen me to be a child of His. I remember working two jobs to save enough money to move out of my parent’s’ house. The same “eye of the tiger” mentality I had as an athlete, now refocused in my professional life. It was not long before I had become an extremely successful sales and marketing professional in my mid twenties. I was winning top performer awards, and earning all-expense paid trips to exotic locations. In my mind I had become better, but where was God in all this? I was ignoring the warning signs along the Damascus road. I continued to push God aside and focus on the temporal. Money became my focus. I wanted to earn six figures, assuming that would take care of all my needs and wants. Without realizing it, I had begun to enslave myself to my ambition. I wanted more! More success, more achievements, prestige and recognition. However, my body and soul began showing the toll of the incessant pressure I placed upon it. Restless nights of anxiety and worry, unhealthy eating habits, and most importantly – no time for God. My bible was collecting dust under my bed, and I never really gave it much thought. Something my youngest sister said to me many years ago at the height of my success continues to resonate with me now, “We really appreciate the financial gifts, but we would much rather see you.” Another warning sign I ignored at the time. Seven months after reaching my goal of earning six figures, I was on my way to another stellar year. I was on track to be the top producing marketer for the 2nd year in a row after finishing runner-up two years prior. Making millions of dollars for my company, I received a promotion as Regional Director of Marketing and given my own marketing team. Then, there was the tragic warning sign. On July 1st, 2010, I suffered a massive stroke in the office just after lunch. I won’t go into the details of the fears I faced, but you can read about it in my award winning book, Unleash the Power of Prayer in your Life. Lying there in the hospital with no one cheering for me or handing me an award, God was there. He was not lashing out at me or condemning me. He spoke to me in the quietness of those lonely hospital nights. God reminded me that I was a child of His and that He has chosen me for His purpose. God has not blessed you with gifts and talents to serve yourself. His desire is for you to live for Him. You don’t have to live in fear about not having enough or worry about being better. He has a bigger purpose and plan for your life. You don’t have to prove yourself to anyone or do anything to show yourself worthy when you know who you are in Christ. Because of the love of Jesus, you have been chosen . You are an integral part of His family. He wants you to live your life in His reflection so that He is glorified and people are drawn to Christ. His love is unconditional and everlasting. Instead of focusing on being better, make it your priority in life to be an imitator of Christ. He has chosen you. You are worthy of His love. Live your life to serve Him, and maybe you can avoid some of the pitfalls on the Damascus Road. I am thrilled to tell you that Horace is offering a signed copy of his award-winning book, Unleash the Power of Prayer in Your Life, as a gift to one reader here this week! All you have to do to participate is leave your comment mentioning Horace’s book in the comment section below. We would also love it if you would share how you personally struggle with the roads of life leading you away from Christ. What are your pitfalls? Horace Williams Jr. is a stroke survivor and born-again Christian who loves Jesus Christ. He has seen the power of prayer and God’s healing in his own life as he continues to recover from a massive stroke that paralyzed his left side 7 years ago. 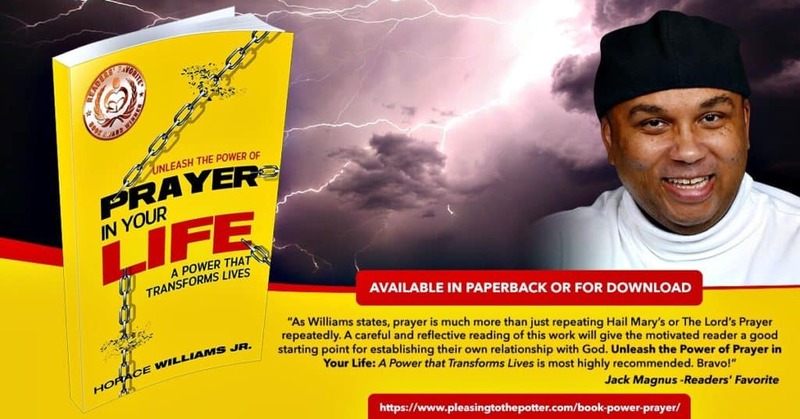 You can get a copy of his award-winning book, Unleash the Power of Prayer in Your Life, here He also writes at Pleasing to the Potter. He writes to inspire, encourage, and remind Christians of God’s transforming power and love. Thank you Lori for inviting me to be a part of the #ChosenandWorthy series. It has been such a joy working with you. May God continue to bless and strengthen you as you seek to give people hope in Christ. Blessings dear friend to you and yours. Thank you so much for your willingness to share with us, Horace! May the Lord continue to bless you! This is so powerful, Horace! God views us as valuable and special; we need to keep our minds aligned to that truth. I laughed when I read the “come to Jesus” with the C grades. I’ll remember that one. Keep up the good work writing, my friend, and praying for you. Lori, thanks for sharing Horace’s words with us today. Many blessings to you! Amen Kelly! We are special in God’s eyes regardless of what we have done or accomplished. It is because of His unconditional love and undeserved grace that we have hope in Him. Thank you for your prayers. You are an encouragement to me my friend. Lord willing, I will continue to write more books in the coming months. Be well and God bless you and your family. Yes, Kelly – Horace has quite a powerful story! I’m blessed to be able to share his story with others! Thank you for being here today! Love this encouragement, Horace: “Instead of focusing on being better, make it your priority in life to be an imitator of Christ.” Your words echo the message God has been speaking to my heart. Thank you, sweet friend! Thank you, Lori, for sharing Horace’s testimony! Thank you for stopping today Crystal. I’m glad to read you were encouraged by this post. Yes, it took me a long time to realize that my worth is found in who I belong to and not my accomplishments. I thankful that God chose me to be a part of His family. He continues to show Himself faithful. Always a blessing to hear from you sweet friend. I hope you have a fantastic weekend and God bless. It’s such a good reminder, isn’t it, Crystal? God is good to continue to gently guide our hearts! This happens more often than not and it’s a reminder to keep our eyes on Jesus. That it’s not about us. Amen, Nylse – yes, it is not about us! Thank you for that reminder! What a great reminder to always put Him first! I haven’t always been good about that, although I’m getting better! I started pulling away from Him in high school. I quit going to church, because, in my childish opinion, those in my youth group were hypocrites. While in college, I was more into the party scene, and socializing became my priority. I was never a hard-core drinker, and I still studied, but I never made time for God. My “Come to Jesus” moment was when I read the first of the Left Behind series when I was in my late 20s. I remember crying thinking, “I don’t want to be left behind, Lord! I don’t want to be left behind! !” It was then that I began to feel the years of neglect and the hole in my heart where He should have been. Soon after that, I found a church and began my journey back to Him. Anyway, thanks so much for sharing your story, Horace! Blessings to you! Wow Allyson, it sounds like you have definitely traveled your own Damascus Road. I am thrilled to read how God is continuing to transform your life as you seek Him. Be encouraged knowing that God is always by your side on your journey. Thank you for visiting today. Blessings. Oh, Allyson, thank you for sharing a part of your story with us. This is what I love about sharing stories – there is something for everyone and we can know that we are not alone, not the only one who has walked a certain road. Thank you, Allyson, for sharing this today! May God continue to bless you! So many words of wisdom and truth here, Horace. You’re testimony is amazing and your faith is truly inspirational, my friend. I didn’t become a Christian until very late in life. I spent many years addicted to drugs and alcohol. People often ask me if I have a lot of regrets. I honestly don’t. God is using those years for His glory today and I’m incredibly thankful for that. Much love and many blessings to you! Thank you Candace for your kind words. I’m encouraged to read that you enjoyed this post. It is awesome and yet so humbling to see God use our past experiences and trials as a testimony for Him. I am so thankful that God continued to pursue me to accomplish HIS purpose for my life. Your story inspires me, and I am glad to know you and to call you a friend. May God continue to bless and strengthen you as you seek to live for Him. Thank you for this beautiful testimony, Candace. It’s amazing what God can do, for His glory, regardless of what our background is! Thank you for your words this week! I loved this today, thank you Horace. Your heart for sharing your testimony and God’s heart always blows me away. I am thankful to know you both. Wow! I love your story, Horace. God is speaking similar messages to our hearts! How blessed we are to be chosen … called by name … not left standing alone! Amen Dianne! What a privilege to be chosen by God, and welcomed into His family. I am forever grateful for His unconditional love. He accepts us just as we are. Thank you for visiting. Have a blessed Sunday and a wonderful week.